Hi, I'm Autus and I like to do stuff on the internet. 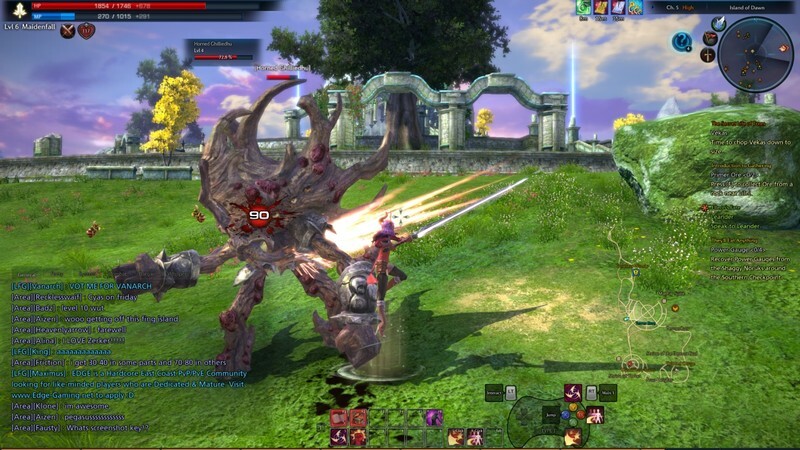 TERA is a free-to-play MMORPG that was released in the North American region in 2012, and has since remained one of the top MMO’s out today, enjoyed by thousands around the world. I have to be honest, I never really had any interest in picking up TERA. I did so because my new gaming group friends were long-time players and they asked me to join them. What I found was much more than I anticipated; quick, responsive controls, a decent combat system, multiple centralized hubs for commerce, and a fairly decent main storyline. Upon first opening the game, I’m greeted with one of the many money-making schemes that MMO’s use: purchasable character slots. This automatically told me that the game has a RLC (real-life currency) store which they use to sell extra features and probably cosmetic items. This isn’t a bad thing per se, but it does help to show where they get their funding. With free-to-play MMO’s like this, I find it’s important to see how they plan to support things; do they offer a cash shop (like this one), or a premium plan which grants extra features/extra experience points (like Star Wars: The Old Republic), or is the game a one-time purchase (like Black Desert Online)? Determining how they make their money helps to identify what ads I’m going to be seeing as I play. And on that note, I was actually extremely surprised – There wasn’t hardly any. Sure, the shop had a rather noticeable icon and loading up the game at the beginning would show a cash shop ad/update, but other than that, there wasn’t anything too annoying to deal with, which was a major plus. An Elin, one of the races in TERA. Character creation in TERA annoyed me, to say the least. I absolutely abhor gender-locking classes, and TERA’s is all about gender-locking. There’s different races which can play different classes, but one race can play literally everything: The Elin, which is a 4-foot all-female race that looks straight out of some moe anime title. It isn’t an exaggeration to say that the game caters heavily to the Elin race, and I don’t think I’d be far off to say that the majority of players use Elin characters more than any other race. And as someone who almost exclusively plays human-like male characters, this was disappointing. Buying outfits from the market for my character was like drawing the lottery; there were very, very rarely any real clothing choices. Elins, on the other hand, have a market packed with every clothing option ever introduced. This imbalance just made me feel like I had less to quest for, and detracted from the game slightly. Now, I think it’s important to mention that my experience with the combat system is mainly from the viewpoint of a healer, as I normally play support classes for all multiplayer games. I did play a little bit as a tank, but not enough to truly draw any feelings from it. That being said, I feel like the combat system in TERA is actually pretty good. There are three different methods of controlling your character which give you different play styles. Character skills generally have short cast times which means quick, rapid combat and seamless action. The skills all have very flashy animations which look pretty cool, too. However, I will say that in a dungeon or other raid, all of the attack animations tend to clash and create a bit more clutter than I’d like. As a healer (especially in TERA), line of sight with your allies is imperative, and the crazy attack animations all over the screen can make it hard to target those who may need healing or buffs/debuffs. With that being said, there was never a moment where I felt like I couldn’t manage, and I experienced relative success as a healer (which is rare in an MMO, at least for me). With all of that being said though, I have to touch on the dungeons themselves. For the most part, the dungeons are varied and detailed nicely. They’re chock-full of enemies to slaughter and the boss fights are generally pretty nasty if you’re not careful. As long as you and your team play well together, you’ll make it through any of the dungeons below the level cap pretty easily. However, it’s the end-game dungeons that irk me. Now, I know some people are completely fine with game guides, but I hate them. I find a lot of enjoyment from figuring things out on my own, writing my own notes, my own personal guide to being successful in any game. It’s part of the experience for me. But with the end-game dungeons in TERA, the bosses are so overpowered that you have to understand their mechanics to even stand a sliver of a chance. And while I would love to have the time to map out the boss characteristics and learn how to beat them through trial-and-error, the other players in TERA are not that patient. As such, it is highly recommended that you pull up a strategy guide to the dungeon you’re going to be playing and memorize it beforehand; otherwise, you’ll discover just how negative the TERA community can be. This right here is what made me drop TERA. Not being able to figure things out on my own in a game is a deal-breaker for me. It ruins the fun if I have to follow somebody else’s map to win. It’s like cheating; somebody already did all of the work for me and I’m just following in their footsteps to success. No thanks, I’ll find something else to do. I’m just gonna cut the review short here because the rest of the game is stuff you can read about from the website, but for all of its flaws, TERA is most certainly not the worst MMO I’ve played, and at $free.99, it’s hard to pass up. I’d recommend at least trying it; if you don’t like it, you’re not out any money.